Before he created a business empire, Richard Branson grappled with dyslexia. The future billionaire would drop out of school at the age of 15 due in part to his learning disability. But clearly he did not let it prevent him from going on to greatness. "Dyslexia is a kind of disability, but actually it's an opportunity if you turn it into such," Branson said on Thursday at SkyBridge Capital's SALT Conference in Las Vegas. Dyslexia is a common learning disability that causes reading, writing and learning difficulties. Branson, the 64-year-old founder of the Virgin Group, said it forced him to master the art of delegation -- a skill that many intelligent people struggle with. "I quickly found people who were much better at things I wasn't capable of doing," he said. 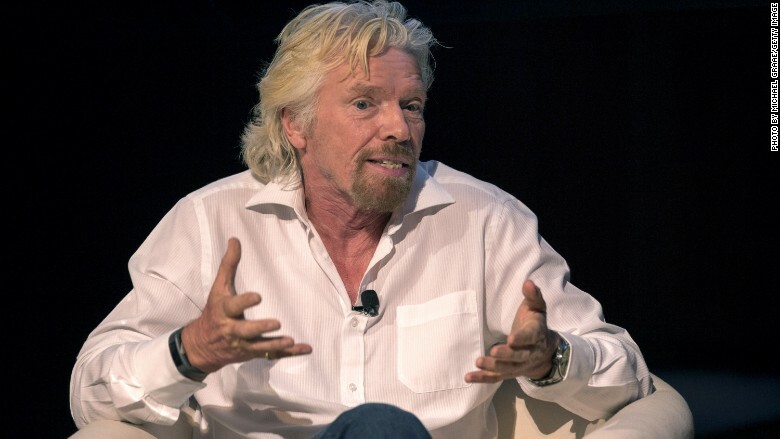 Simple communications: Branson, whose business empire includes hundreds of companies including Virgin Atlantic, said dyslexia also made him emphasize clear communications with customers. That includes removing the kind of jargon that consumers loath in financial-services companies. "I don't want it because I don't know what the hell it means," the billionaire said. It also helps explains the very clear and simple advertising messages that Virgin employs. "We have a test: If Richard can understand it, then anyone can understand it," Branson told the audience of hedge-fund managers. Branson is hardly the only person with dyslexia to achieve success. Other famous people who overcame dyslexia include Charles Schwab, Jay Leno, Whoopi Goldberg and Nobel Prize-winning molecular biologists Carol Greider and Elizabeth Blackburn. Related: Is this Richard Branson's next investment? Don't need to be a financial genius: Branson said that as recently as 14 years ago he had a tendency to respond to figures presented at meetings with the question: "Is that good news or is that bad news?" At one of those board meetings a director even yanked Branson into the hallway to call him out for not understanding the difference between basic financial terms. Branson said the story shows that ultimately these types of things don't matter that much if you're good at delegating. "You don't have to be a financial genius to build ventures," he said.